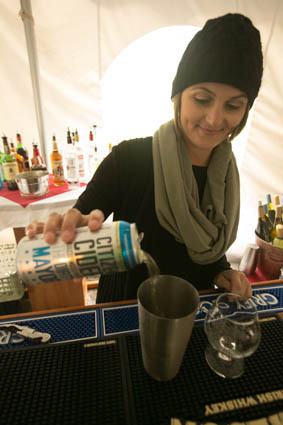 Citizen Cider’s “Dirty Mayor” is poured into a shaker in the creation of a mixed cider drink by pourer Amanda Wheeler. Saturday, Sept. 12 at 1 p.m. — KILLINGTON — Following a successful debut in 2014, the 2nd annual Vermont Cider Festival will be returning to Killington on Saturday, Sept. 12, celebrating the art and artisans of New England cider-making. The one-day event will take place under an elegant white tent at The Foundry at Summit Pond, with its stunning views of the peaks and trails of Killington Resort. Festival-goers will explore a comprehensive selection of both hard and natural crafted ciders including local favorites and national best-sellers, as well as a sampling of meads and ice wines. Locally harvested apples and award-winning Vermont artisan cheeses will also be set up for tasting and purchase. Festival hours will be from 1 to 5 p.m.
Over 50 different brands of crafted hard ciders are confirmed for the festival, including Citizen Cider, Woodchuck Cider, Champlain Orchards, Angry Orchard, and many more. Entertainment will include Vermont bluegrass music by the Bondville Boys, who were a big hit with attendees last year. The Foundry opens for lunch at 11:30 a.m., and the festival tent opens at 1 p.m. for sampling. Advance tickets are $30 (plus tax) for adults 21 and older, and are available online at www.vermontciderfestival.com. On the day of the festival, tickets are $35 (plus tax). Admission includes a souvenir tasting glass, full color festival guide, unlimited sampling of 50+ ciders and live entertainment. A special “Designated Driver” admission is also available the day of the festival for $10 (plus tax), which includes admission into the festival without the souvenir glass or cider sampling. There is no admission charge to The Foundry. The Foundry at Summit Pond is located on the Killington Road in Killington. For more information, call 802-422-5335, or visit www.vermontciderfestival.com.